Looking for a place to stay near Grand Lake, OK? Monkey Island RV Resort is a great choice for your family even if you don't have an RV. Located just yards from the shores of beautiful Grand Lake O’ the Cherokees in Northeast Oklahoma, Monkey Island RV Resort is an upscale RV resort community designed with our guests in mind. With a rating of 9.5 from Good Sam, we’re Monkey Island’s newest luxury RV park and the No. 1 rated park at Grand Lake. Our amenities include an on-site convenience store, a spacious clubhouse with private showers, 30/50 amp service and 100 percent concrete roads and RV sites. Monkey Island RV Resort is adjacent to Tera Miranda and minutes from championship golf at Shangri-La Golf Course with shuttle service available. 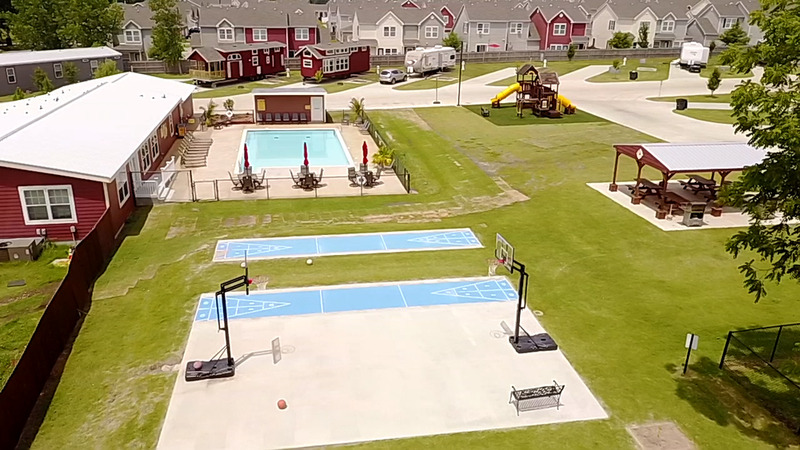 From a fenced dog park and free wi-fi to a playground and outdoor swimming pool, we pride ourselves on creating unique RV resort experiences for our guests. Our tranquil retreat sits on 10 acres of land and is the perfect year-round getaway. Monkey Island RV Resort is conveniently located so you can easily enjoy all of Grand Lake’s abundant recreational activities, including some of the nation’s top fishing spots and lakefront golf courses. From Memorial Day to Labor Day, we also offer a number of activities for our guests to enjoy at the resort, including outdoor Movies in the Park. In addition to our 70 RV sites, we also have 16 fully furnished cabins, as well as RVs and tiny homes that are available nightly and monthly rentals. Find out more about the many luxury amenities that make our upscale RV resort community stand out. We invite you to discover for yourself what makes Monkey Island RV Resort one of the best parks in the state.